Ashford Castle, with its fairy tale setting, is therapy in itself – an idyllic sanctuary of calm and contentment where the cares of the world are easily forgotten. To enhance your sense of wellbeing even further we invite you to visit one of Ireland’s most wonderful spas for some extra indulgence and pampering. 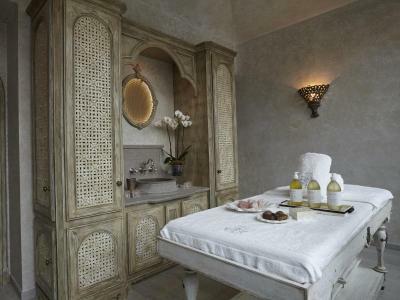 Our expert therapists offer a range of treatments to soothe, refresh and rejuvenate body and mind. Renew, revive and refresh with a 60 minute Face & Body Sensation treatment including a massage and a facial. Smooth out wrinkles, and restore your youthful radiance, with an intensive booster anti-ageing facial then choose from either the unique 'Re-Energiser' massage, to relieve stress tension and ease aching muscles, or the'Tranquility' massage, to induce a deep level of relaxation and calm. In the evening experience traditional Irish cuisine with three-course dinner in The Dungeon.